September and October is a great time to visit as the heat from summer starts to fade and walking and climbing at lower altitudes becomes possible again. Although there will be occasional rainy days, any moisture brings life back to the plants and a second growing season begins. Any rain in the valleys is likely to bring a dusting of snow on the high peaks, though this will melt quickly as snow tends not to lie before November. Water will be flowing again in the acequias (water channels) which are often lined with chestnut trees who’s leaves turn to gold then brown as autumn progresses. This is a great time to visit for a walking holiday. Low season hotel prices coupled with mainly settled weather that will seem like summer to anyone from Britain. Walking in the Alpujarra (hill walking) and Sierra Nevada (mountain walking) is as good as it gets with some truly memorable days to be had. An ascent of the Cerro del Caballo which at 3011m is Europe’s most westerly 3000m peak. To make the most of your visit, check out our website where you’ll find all sorts of useful information and suggested itineraries. If you have a question about the area that isn’t answered on our website do get in touch, we are always happy to advise. Like all mountains, these can be serious too. Only venture into the hills if you have the right skills. 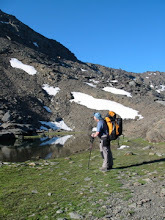 You can always hire a guide from Sierra Nevada Guides. Mountain House Holidays have places available on their walking and scrambling holidays scheduled for September.